Sofia Andres is the newest local celebrity to get noticed by an international star. 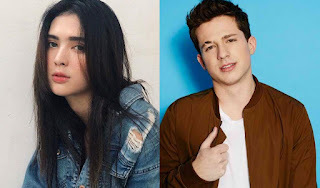 The 'Pusong Ligaw' actress got noticed by American singer-songwriter Charlie Puth when the latter went live on instagram on August 1. Just like any normal fan girl, Sofia immediately took to her twitter account to post photos of Charlie, showing the moment when she was greeted by him. Last month, Kim Chiu was also noticed by Justin Bieber when he also went live on instagram. He even looked forward to seeing her on his concert in Manila. But, it has been cancelled 'due to unforeseen circumstances'.